One young female unrepresented by counsel pleaded guilty to theft of more than $11,000 at a dwelling house in St Aroment between December 19, 2010 and May 30, 2011 when the Roseau High Court began its January 2013 criminal assizes on Tuesday January 15, 2013. 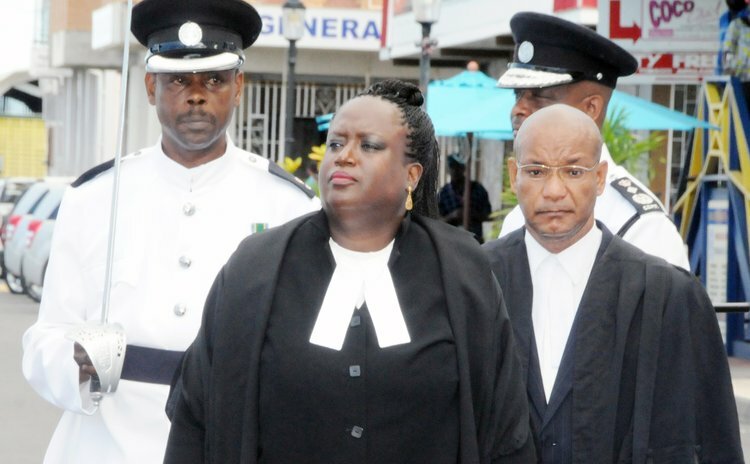 Sitting judge, Justice Birnie Stephenson, set sentencing for Friday March 1, 2013 with lawyer Dawn Yearwood-Stewart agreeing to assist the young female. Another female and three men including Sherman Webb who is serving life imprisonment for the murder of a young Barbadian last year had matters against them discontinued by the office of the Director of Public Prosecutions. While the judge told three of these that they were discharged and free to go, she was mindful to tell Webb only that he was discharged. Two murder trials are down for the assizes – Shane Degallerie and Clement Labassiere had matters traversed from the last assizes in September 2012. A third, Edward Green of Morne Daniel, charged with the murder Damian Dorival on October 31, 2008 was traversed to the next assizes in May. Counsel for Green, Peter Alleyne needed time to peruse the voluminous depositions related to that matter while the DPP's office also needed more experienced counsel in their ranks to prosecute given the pending resignation of Gene Pestaina as Director of Public Prosecutions. Meanwhile, the sentencing of two young men, Steven Wyke and Johan Charles for the offence of burglary was deferred to Monday January 21 by Justice Stephenson to allow for Wyke to have a medical review. Wyke and Charles who were represented by Counsel Dawn Yearwood and Bernadette Lambert respectively pleaded guilty to burglary of the dwelling house of Patrick Simeon at Sultan in the parish of St Joseph on Tuesday June 8, 2010 when they appeared for their trial before Justice Stephenson on Monday November 19, 2012.